Goalkeeper David Cornell has hailed the maturity, composure and ability of Cobblers teenage prospect Jay Williams. The 18-year-old is becoming something of a regular fixture in the Town first team, having started the past three games, playing both as a central midfielder and a central defender. In Saturday’s 3-0 win over Carlisle United, the Cobblers academy product started in the back three alongside Aaron Pierre and Jordan Turnbull and turned in a near flawless performance. 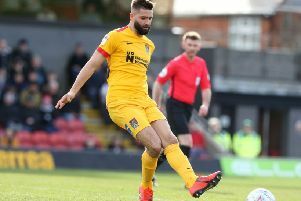 As well as being solid defensively, Northampton-born Williams, who signed an 18-month professional contract with the Cobblers two weeks ago, was excellent on the ball. He was cool and calm even when under pressure and his distribution was impressive, but that wasn’t something that surprised Cornell who sees the former Kingsthorpe College pupil in training every day. And he added: “Since he has come in, and he has played a little in midfield as well, you can see when he trains with us that he has got that bit about him which maybe some 18-year-olds don’t really have. “I gave him a pass on Saturday where the was a man closing him, and I am looking at it thinking ‘it’s not a problem’, because I know he can deal with it. With Ash Taylor still struggling with a groin injury, Williams is set to start in defence again in Saturday’s Sky Bet League Two trip to Cambridge United (ko 3pm).